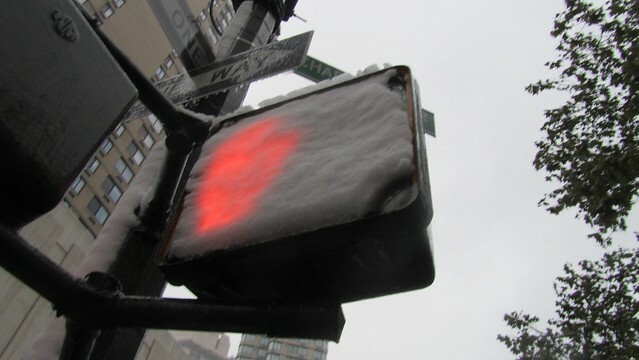 ← thank you friday: snowtober, fall, brooklyn bridge, Coco, phone calls with dad. me: Dad, omg it’s snowing! We are getting ready to go out! yay! Dad: Wait, now that it is snowing you are going out? me: Yeah! 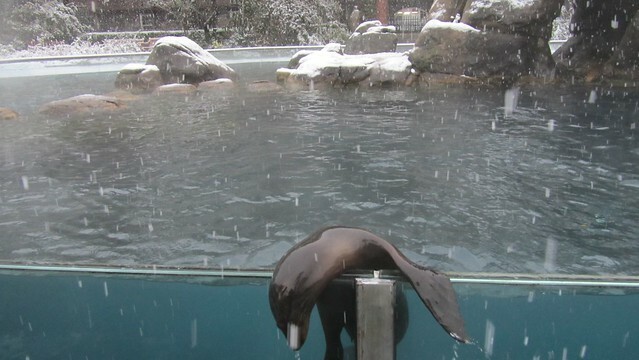 It’s no fun playing in the rain but playing in the snow is awesome! Dad: ok, have fun, watch out for the wind. be careful. We were totally unprepared for the snow. I had to pull out a ton of stuff from our hall closet to find our snow boots and I left the house without an adequate scarf and I never found any of my knit caps. Regardless, we had a very vague plan of checking out the Central Park Pumpkin festival and then seeking out a new winter coat for me. I only have wool pea-coats which are great but not ideal for some outings. And of course we’d be goose-chasing. As we arrived at the park we decided to check out the zoo first. The long slow walk to the Zoo entrance was so peaceful save for the fallen branches and the kindly runner who warned us of other fallen and falling branches in the park. 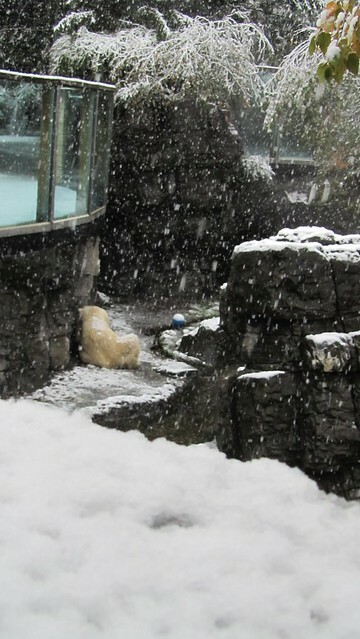 The Zoo staff had sullen looks on their faces that I interpreted as “I don’t want to be here” and “You are crazy for being here” but they let us in anyway and we delighted in the fallen snow and the sea lions and the polar bear. We made our way up the hill to the snow leopard area and had to duck under a giant fallen tree limb before someone came and said they were closing and we’d have to leave. From the Zoo we headed north through the park with the intent of crossing to the West side before exiting. But even when we were in the Zoo we could see and hear the cracking and the trees shaking as branches collapsed under the weight of wet snow. As we walked the path the snow was heavy with moisture. The ground was full of puddles and snow alike. We took a few moments under one of the bridges to tweet and saw the Zoo gates being closed behind us. 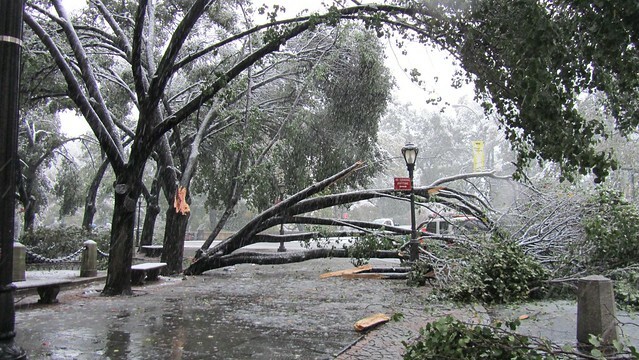 The cracking echoed through the trees and we saw downed branches the size of cars. 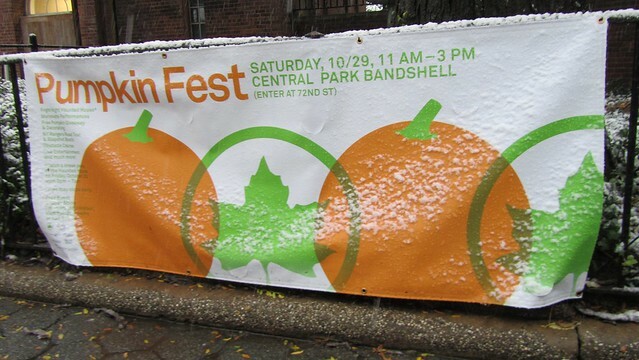 Clearly conditions were such that the Pumpkin Fest must have been canceled. We decided for our own safety we’d have to leave the park. It was a lovely, if creepy stroll while it lasted. The train delivered us to the West side and soon the puddles were inside my shoes. North Face had some great boots but my size wasn’t in stock. We did however get out of there with about $150 worth of goods. 2 pairs of gloves and one winter hat. North Face is pricey but the gloves are the fancy e-tip style that allows you to use your iphone touch screen without removing them. Eastern Mountain Sports offered a great coat selection but again not in my size. “Not in my size” is a theme in my life. I tried on a few mens coats but men are built differently than women. They have no hips and I need a coat that offers a button/zip option not just one or the other. 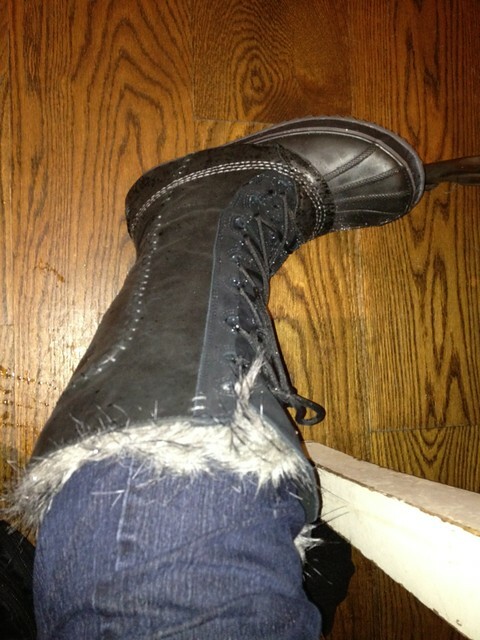 I only glanced at the boots and coveted a few pairs but had already decided to wait on the North Face ones. Century 21 was smaller than I expected and both the coat and boot sections were a disappointment. As we were deciding where to go next I realized that my socks were really wet. Last year’s winter boots just gave up entirely on this year’s first snow. I needed new boots asap. We doubled back to EMS and as I asked for a size I had to shamefully tell the sales girl, Elizabeth, that I’d also need new socks as my boots had sprung leaks. :( She was really great about it and I got over my boot shame quickly enough. She brought me the boots I asked for and I fell head over heals for the ones she suggested as my 2nd option. I didn’t even glance at the 3rd option, ok I glanced but clearly they were not for me. I opted for the muted black ones over the awesome two tone ones and practically skipped out of there with a smile plastered on my face. We ended up at Magnolia Bakery and actually got seats! I’m not on the cupcake bandwagon, or the super sweets bandwagon but their German Chocolate Cake is to die for. Literally, if you eat a whole slice you might slip into a sugar related coma. Luckily Paul was there to finish it off for me after he finished his… I don’t even know what he had, I was too consumed in my cake. 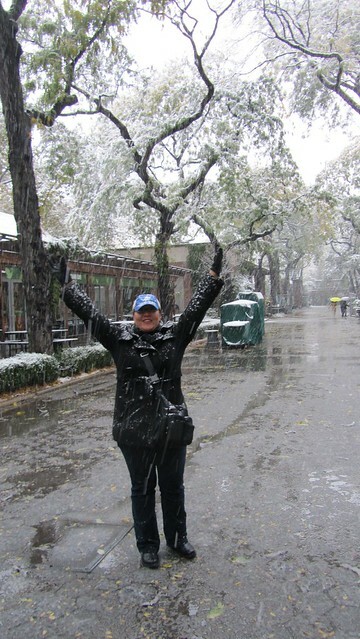 Anyway, Snowtober was one of those truly good days. There was no Pumpkin Fest for us this year but I mean there was snow, there was central park, there were animals, there was shopping, there was cake, and there was my silly husband. I won’t spoil it by mentioning how I found a piece of paper cooked into my burger at Big Nick’s Burger Joint. I will mention that we went to the Coco MoCA and it was awesome. Blog tomorrow about the hijinks involved…. This entry was posted in everything i've blogged, locations, observations and tagged Central Park, Columbus Circle, Magnolia Bakery, manhattan, museum, New York City, pretty, Pumpkin Fest, snow, walking, weekend adventure, Winter storm, zoo. Bookmark the permalink.